Your bi-monthly source of the latest products. The Versatile shapes range is the latest expansion to the ntgrate premium woven vinyl flooring range from GEO Flooring. Versatile’s Flowerz and Hex shapes fit together like puzzle pieces. 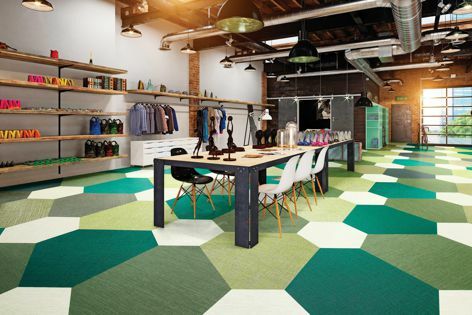 Following on from the release of ntgrate premium woven vinyl late last year, GEO Flooring has introduced the new cutting-edge shapes of Versatile premium woven vinyl flooring. Designed by renowned Belgian product and interior designer Gerd Couckhuyt for ntgrate, Versatile brings a variety of shapes for designers to play with for a truly unique flooring design. “You see squares and rectangles everywhere. Everybody hides the seams. I intentionally go against the grain; the lines should come alive. Bring out the true nature of your floor,” said Couckhuyt. To add extra character to flooring, Couckhuyt created the five new shapes of Versatile – Bean, Frame, Hex, Flowerz and Star. Designers can play with the shapes and laying direction until the puzzle fits, from bold Bean, to futuristic Flowerz, creating the perfect combination for the space. © 2019 Architecture Media Pty Ltd. All rights reserved. Join 27,000+ of your colleagues and get the latest products, delivered to your inbox. View a sample.